My mom (aka the Snack Tray Queen) makes these often, we had them at our wedding reception, I’ve made them for groups as small as our family and as large as one-hundred-fifty. But, believe it or not, I didn’t like them! Well, at least that’s what I thought. I’ve mentioned before I used to be a picky eater. Mostly, I made up my mind before trying things whether I liked them or not. That’s what happened with Sausage Balls. The first time I ever tried them was a few years ago when my daughters, a friend, and I were making them for a Mother-Daughter brunch for a large group of ladies. They smelled so good I decided to try one…. Well, let me just say….I LOVED THEM! We ate so many I was afraid I wasn’t going to have enough for our Mother-Daughter! They are addictive. You really can not eat just one. They do take a little time so I almost always make them ahead, sometimes the day before and sometimes a couple of weeks. If I make them more than a day or so in advance I freeze them on a baking sheet then put them in a freezer bag. A couple of hours before I’m ready to serve I put them in the crock pot on low or keep warm to thaw and re-heat. If mixing raw meat with your hands “grosses you out” you may just need to enjoy them when someone else makes them. A spoon just won’t do, sorry. 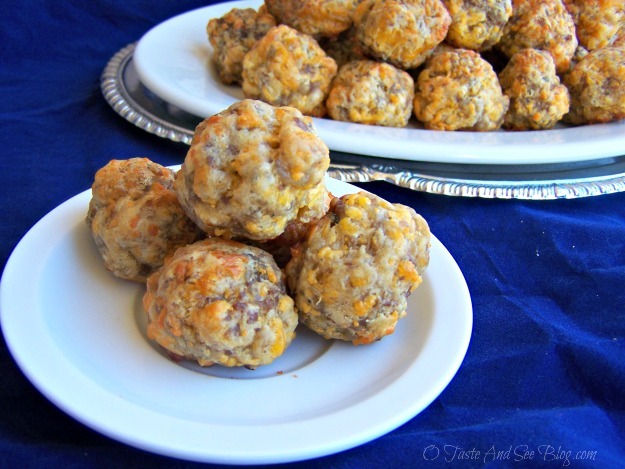 With Sausage Balls, it doesn’t matter how many you make….they will all be eaten! Place in freezer about 1 hour or until frozen. Can be made ahead and kept in refrigerator a couple of days or in freezer 2-3 weeks. Thanks! So glad you enjoyed the recipe. I appreciate you taking time to leave a comment! I have been making sausage balls for years, but, have never put water in them. Do you know what putting water in does to the flavor and texture? Thanks for the question. The water is sometimes unnecessary. If the mixture is a little dry I add the water. It doesn’t alter the flavor at all or even the texture… it just helps them stick together better. I’ve made sausage balls for years but I was checking your site to see if I could find a way to keep them warm after cooking, as I drive to a wedding shower that takes place in 3 1/2 hours. Didn’t see any information on this . I did make them ahead and freeze and then took them out, thawed and cooked it’s a great great time saver!!!! I know they’re delicious at room temperature as well so that might be how I serve them. Thanks again! Good question! Honestly, I’m not sure there is a way to keep them warm for that length of time. You could try heating them in the crock pot before you leave then transporting them in the hot crock pot. If you do that I would suggest “cracking” the lid a little so they don’t sweat. Hope that helps a little. If you do come up with a successful way I’d love to hear about it. I am making sausage ball per your recipe. Thanks for the tip of making ahead and reheat tips. Great tips. Thank you, thank you, thank you. Thanks for asking Billie. It does depend on how big you make the balls but probably about 30 or so. Thanks for stopping by. Going to make these for my son’s graduation party! Thanks for the directions on how to make ahead and freeze! That will be a big help. Great! Glad to help out! I love these we made these all of the time when I was a kid! Looks fun! My kids would probably love these. I pinned these. I can’t out into words how much I love sausage balls… But it’s a lot.. I end up hurting myself because pork gives me wicked migraines but they’re so good!! I’m thinking of making this for a 4th of July party we were invited to. Easy, not messy, and sounds delish. Pinned! Cherie, they are perfect for parties! Thanks for stopping by.